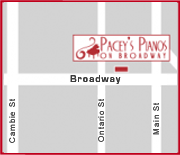 Pacey’s Pianos all of the interior of BC including Kamloops, Kelowna, Vernon, Nelson, Salmon Arm and beyond . We can arrange for delivery of any new or used piano and have a qualified local technician service it for you. Brands available to Kelowna, Kamloops are Mason & Hamlin, Schulze Pollmann, Knabe, Orange Digital and used Yamaha pianos at outstanding prices and we can deliver almost anywhere. We are the Kamloops piano store and Kelowna piano store!